We're planning our lives at Paper Sweeties today! 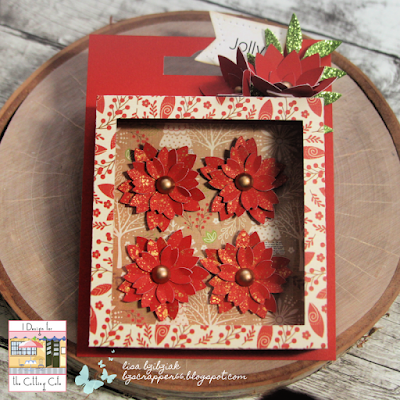 And there's a really adorable new stamp and die set in town just in time for Christmas! 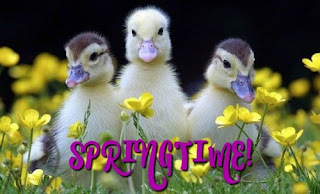 So guess what this week is!!?? 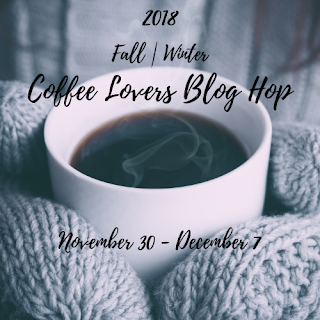 It's the Fall/Winter Coffee Lovers Blog Hop! 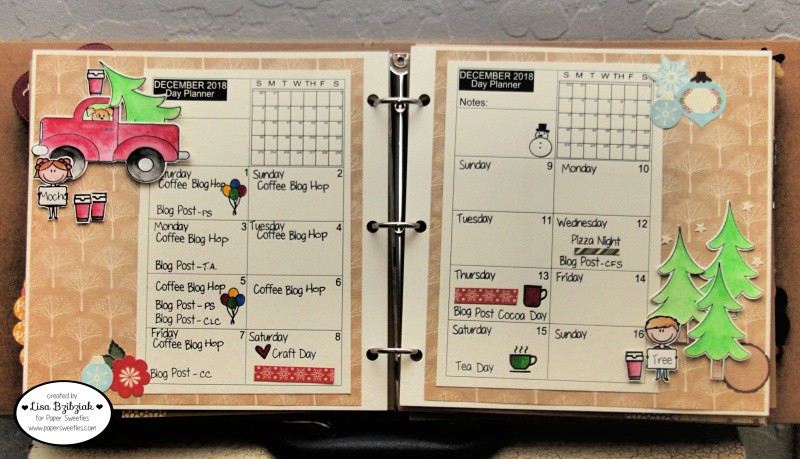 My planner pages are full of coffee! I mean... that's what I plan on doing all week... well. I might go to work... maybe. And the Coffee Planner set is quite awesome! So welcome to the new Merry Christmas Y'all Stamp and Die Set! 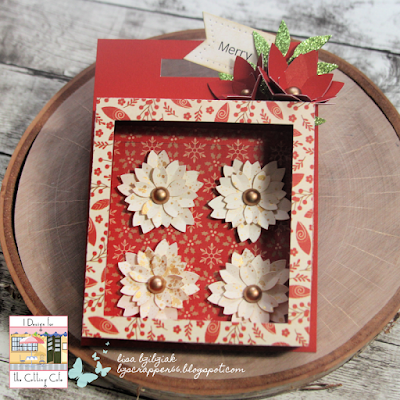 You can pick this set up in the shop now! 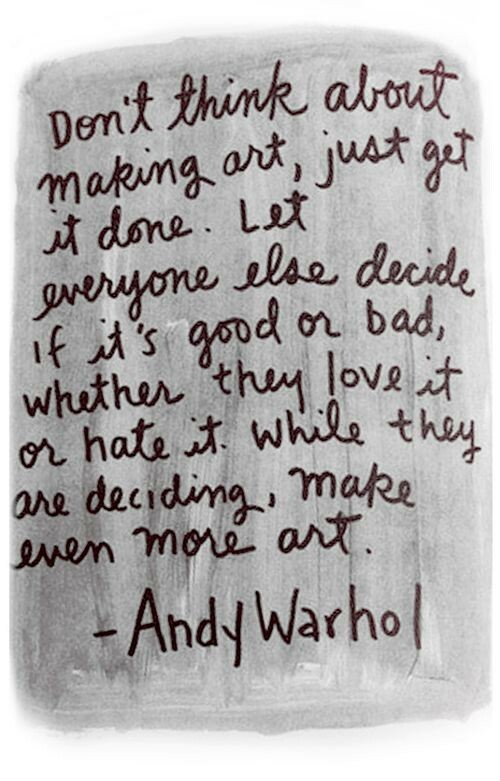 Yes, as we speak! So do you see what I did here? I mean.. isn't a big part of picking out a tree getting a cup of cocoa or a cafe mocha... I'd prefer the coffee for sure! 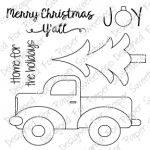 Isn't that truck just the cutest??? I stamped my images with some Gina K Amalgam Ink onto watercolor paper and colored them using my Albrecht Durer watercolor pencils and a waterbrush. I hope the guy that just picked up his tree doesn't forget he set his cup on the top of the truck! 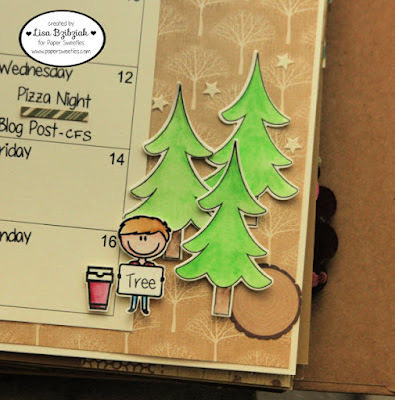 The tree is from the new set also along with a few really cute sentiments! 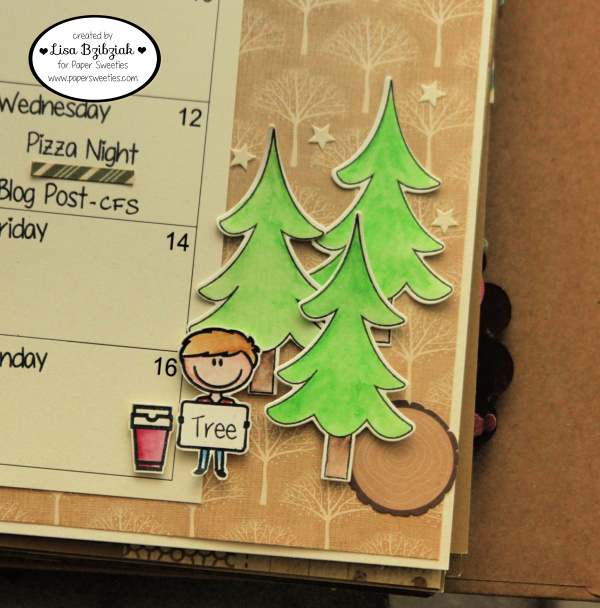 I added a few stickers to my layout and I'm ready for December! And did you know this is going on? 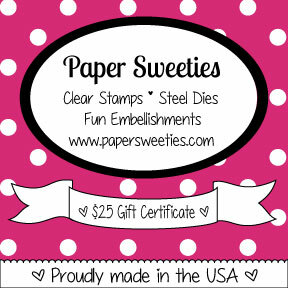 Paper Sweeties is a Sponsor! 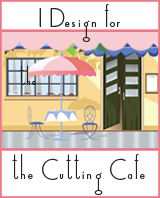 Just link up any project with a Fall/Winter Theme that includes coffee, cocoa or tea for a chance to win a prize! Link up as many different new projects as you like! 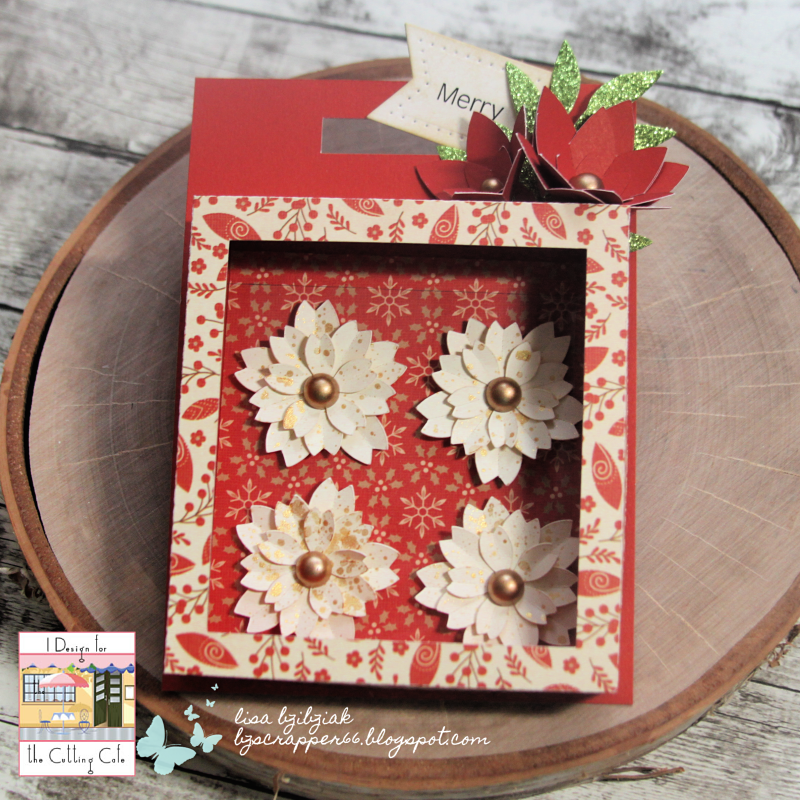 For all of the details, visit the main blog post here! 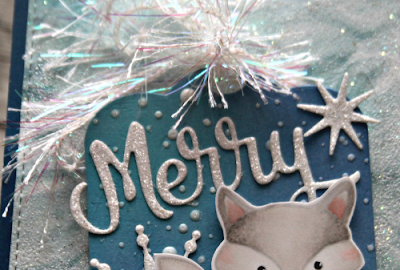 I'm also playing along with the Sweet Treats for the Holiday challenge over at Double Trouble and Use Your Stuff is partnering with them with a beautiful mood board and I'm linking up there too! 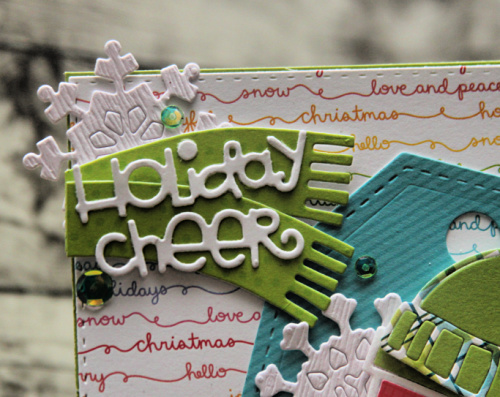 It's all about Holiday Food and Drink over there! And there's a special sale going on! 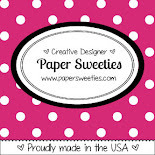 No better time than now to pick up some fabulous Paper Sweeties goodies! 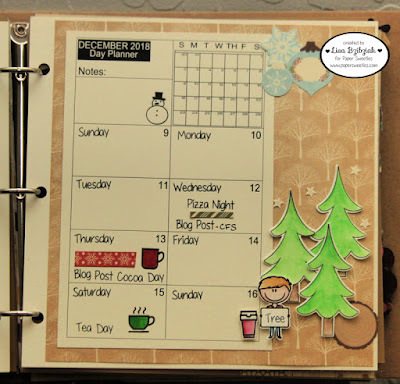 One of my absolutely FAVE To Go Cup dies is the Cozy Coffee die from Paper Smooches... I mean.. 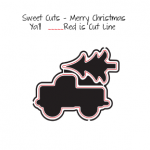 I just love that the die cuts out the outline and all of the pieces. 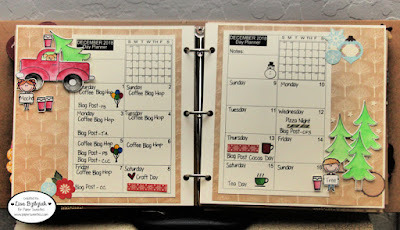 I just cut mine a few times out of various papers and piece them together upside down and then add foam tape across the whole thing... or regular adhesive if you like things flat... but why would you want to do that?? I started with that adorable Lawn Fawn Really Rainbow Christmas Paper. 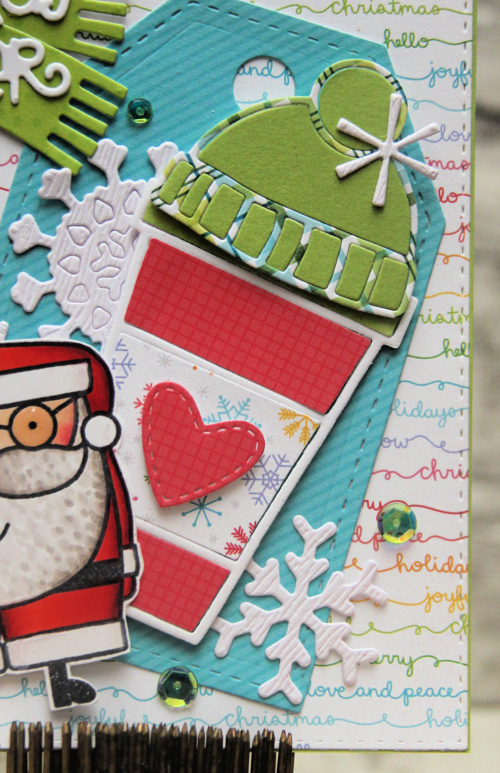 Then I just mixed and matched them and cut out my cup pieces along with that awesome hat for my cup from the Snowman 2 Die... it was the perfect size! 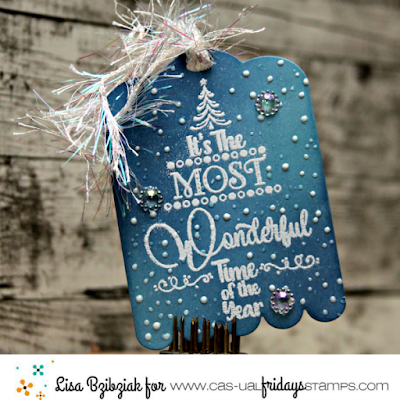 And the largest tag from the Gift Tags 2 Dies made the perfect backdrop. And if you've been following me on Instagram you may have seen this fellow before... but probably not his friend! 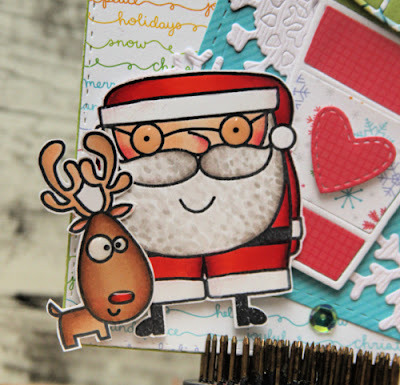 These images from the Santa Paws stamp set... really all of the images from that set... so adorable!! I'd say that I'm pretty sure these are Santa's two best friends... the hugest cup of coffee (with a hat to keep it warm) and his little buddy Rudolph. What else would you need? 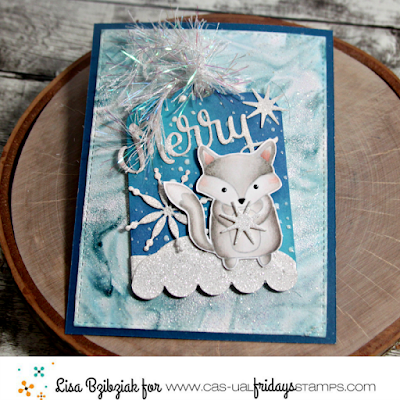 A few snowflakes from the Snowflakes Dies, the scarf from the Snowman Card Dies, and that awesome sentiment (don't you just love all of the Paper Smooches sentiment stamps and dies????) 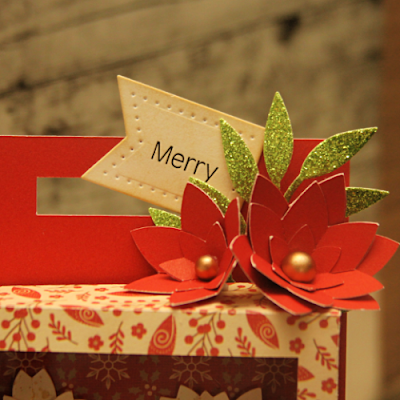 from the Christmas Word Dies. All I needed were a few sequins! Just the cutest right?? 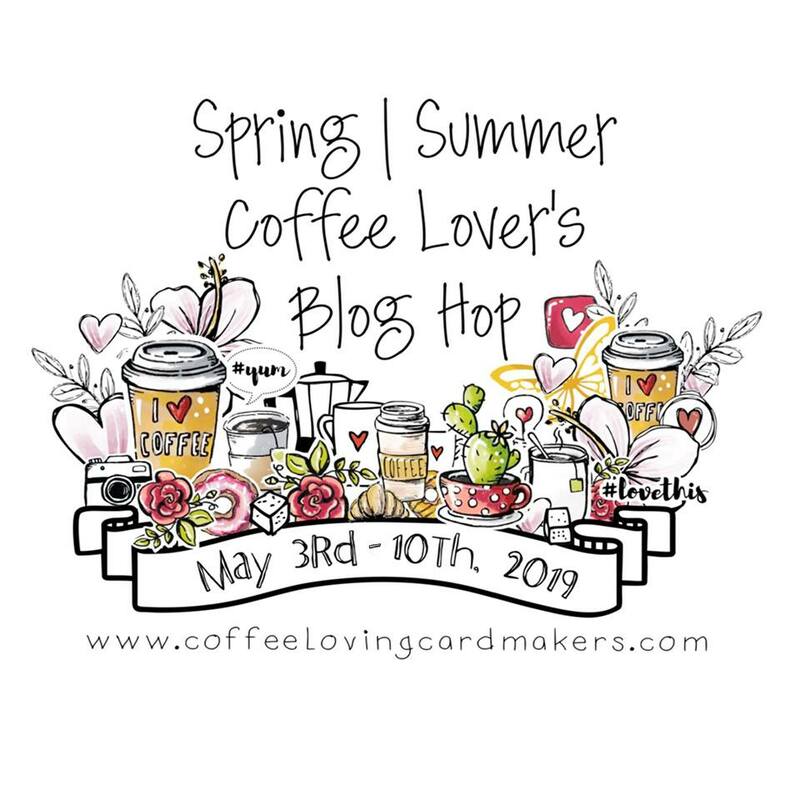 Now, head on over to the Coffee Loving Cardmakers Blog Post Here for all of the details! 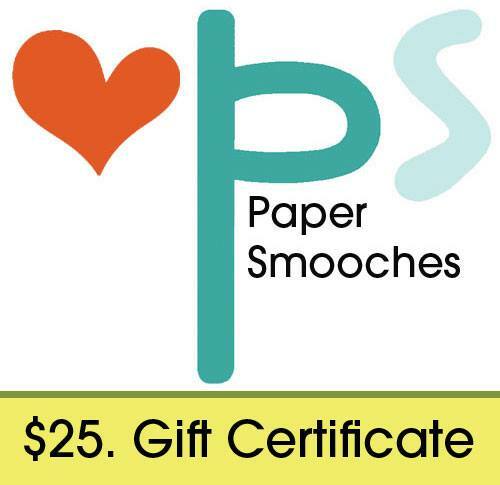 You'll be able to check out all of our awesome sponsors, including Paper Smooches! 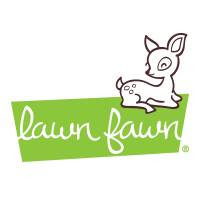 Be sure to thank them for all of their wonderful support of our beloved hop.. and Amy!! 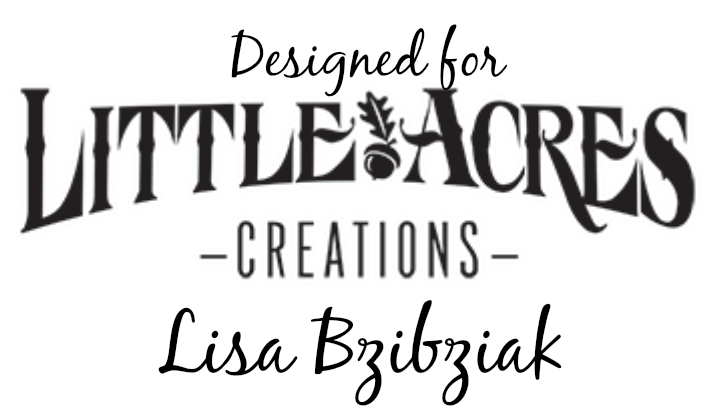 Please don't forget our Fearless Leader Amy Tsuruta who works so hard to make this hop happen... Thank you Amy!! 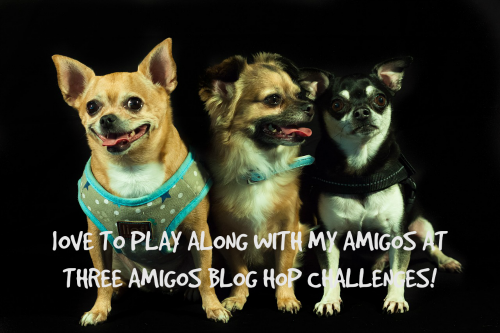 And play along! Nothing to lose! 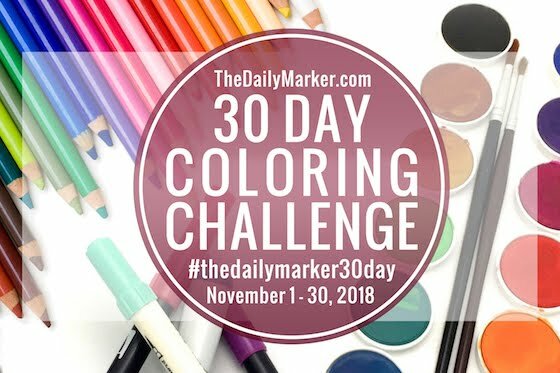 I'm playing along with a couple challenges today too! 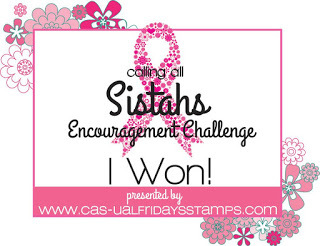 Check out the Simon Says Stamp Wednesday Challenge which is Anything Goes! I'm also playing along with the Holiday Challenge over at Cupcake Inspirations... if you've never played along over there you should definitely take a look! 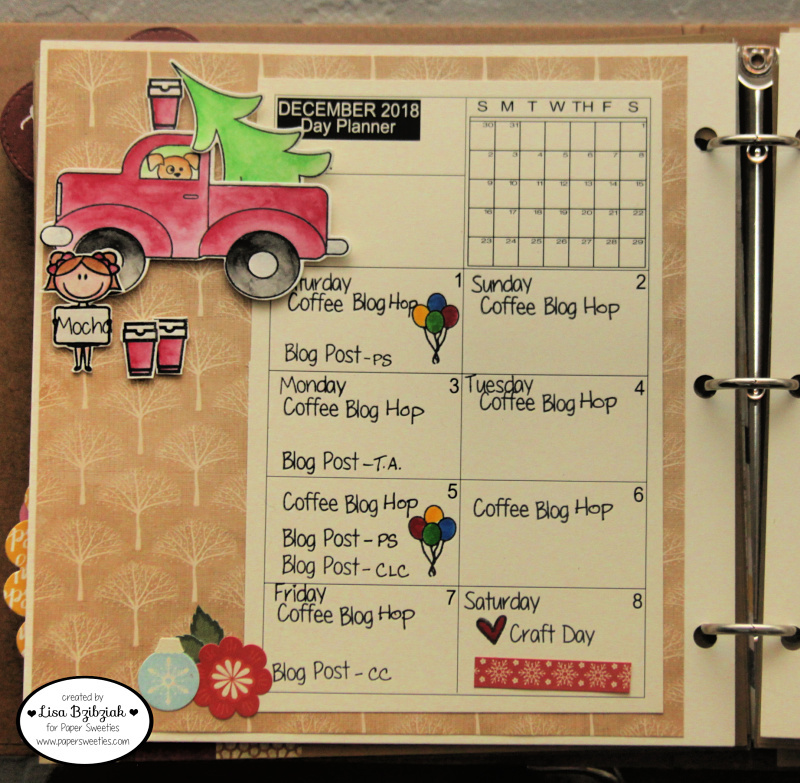 And be sure to check in on on Paper Smooches on December 1st for their next challenge... you know I will be heading over there! Thanks for stopping and hope you'll come back tomorrow... 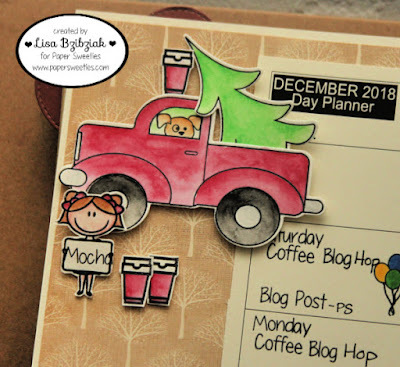 I'll be having lots more for you this week.. maybe even a little Blog Candy! So glad you are here! 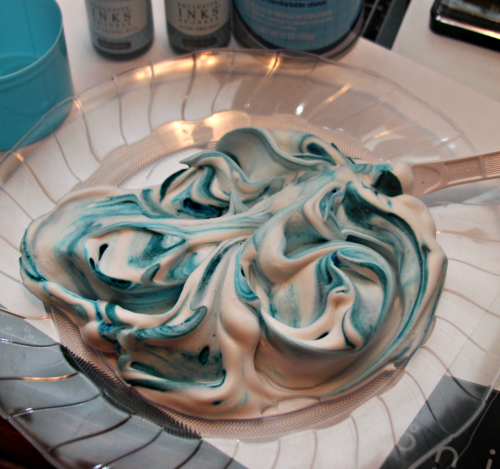 Today I'm up on the Cas-ual Fridays Blog and I'm showing you how I made this cool shaving cream background! And after we'll talk about that tag! Some of you may already be familiar with this type of background and it may be new to some of you. 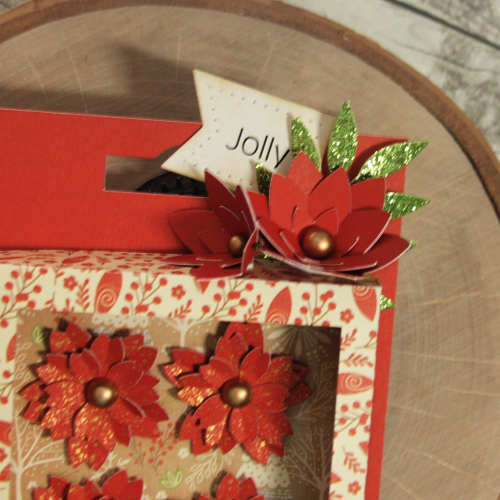 I just learned it last year and it's quick and easy and just a little bit messy! 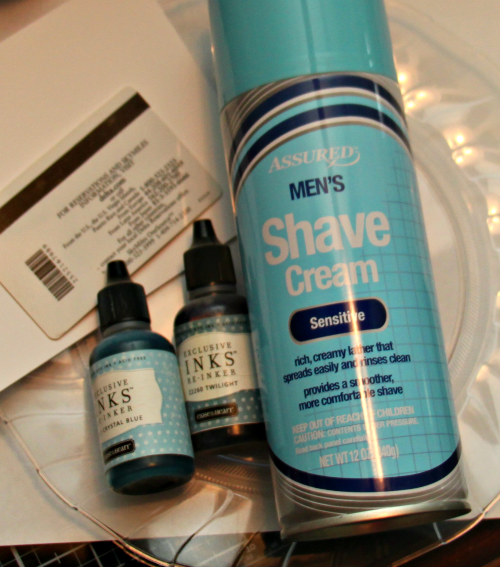 You'll need some shaving cream (dollar store is just fine), some water based re-inkers (I just used my old CTMH ones), a paper plate (or a plastic one like I have here which would be re-usable), an old credit card, some paper (a bunch of white 5 1/2 x 4 1/4" sized pieces are just right), and also a plastic knife which isn't in the picture. 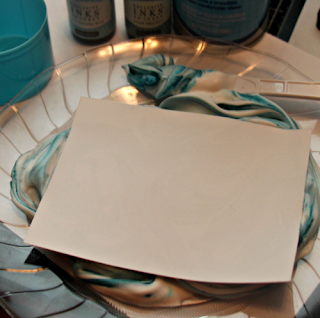 You'll want to have some paper underneath you too because as I said... little bit messy! 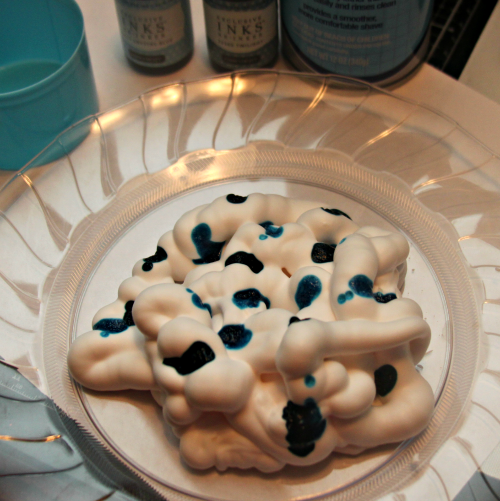 First you just spray a big blob of shaving cream onto your plate. Then drop some of the reinker around into the blob... I had two different shades of blue so I made sure to make my drops in kind of a random pattern, interspersing the two shades. 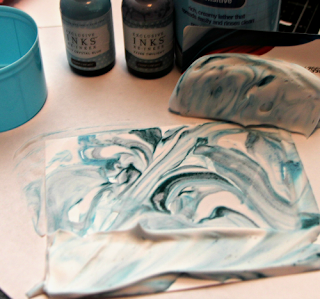 Then you will use the knife to move the shaving cream around... "fold" in the inks. You don't want to mix them together too much unless of course you want less contrast and swirl... but you'll see you can make multiples from this and as you go there is less and less contrast so you get a fun and varied set of backgrounds. 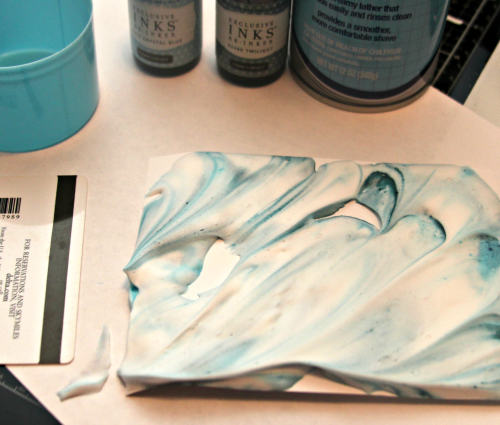 And as you scrape it across to remove the shaving cream, your piece of art is revealed! Cool right? I made four backgrounds with this one plate of shaving cream and probably could have made a few more! 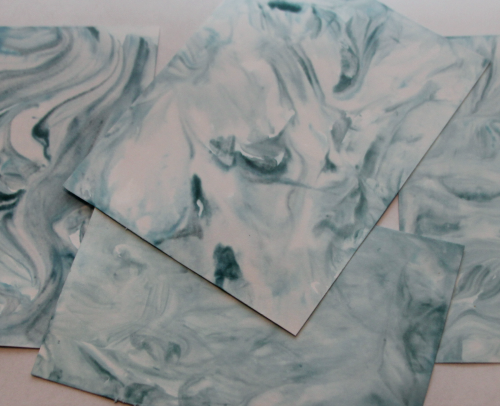 Notice the difference between the top and bottom ones... as you work with the shaving cream, the ink will blend together more and you'll have a little less white and a little more of whatever color you've used. 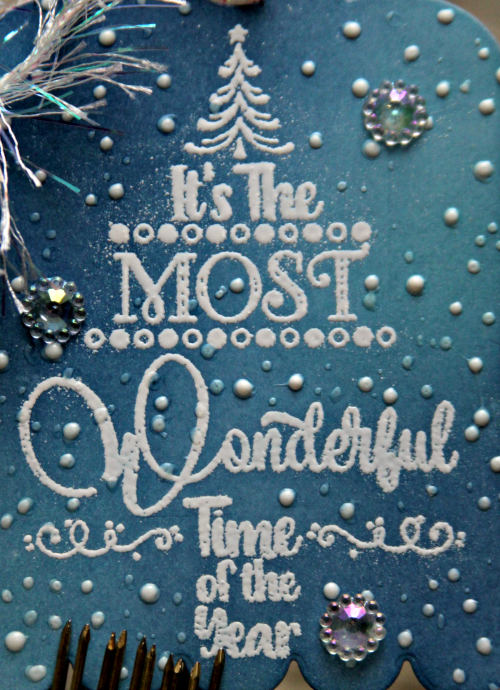 Then once they're dry you can use them as they are or I gave it a twist and I smooshed Versamark over the entire top.. sprinkled some Wow Sparkling Snow Glitter Embossing Powder over the top... just a little because the stuff will pretty much cover the swirlies (ask me how I know).. and then covered the rest with some Clear Embossing Powder and heated it. And you don't have to use these as just backgrounds... 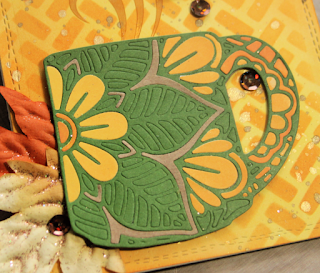 I have a bunch that I use with diecuts... like the leaves I used on my Autumn Shaker here! 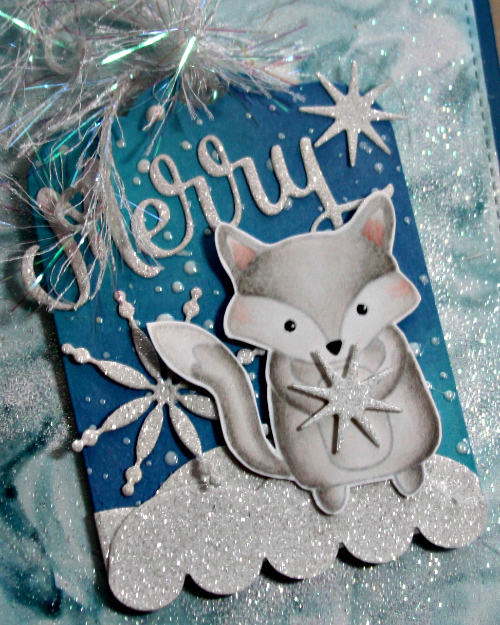 And that's how I got that pretty sparkly swirly blue background for my card! 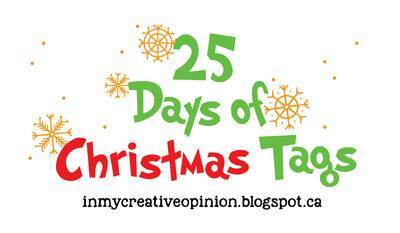 And you may have visited me for the CAS-Fridays day over at 25 Days of Christmas Tags when I told you I made a 2nd tag inspired by Jane Taylor's beautiful tag because I wasn't able to use the snow mounds I'd created on my tag for that day... so here it is! I used the Scalloped Tag Fri-Dies (to cover the scallops on the tag) and the Bubble Box Fri-Dies (to create my snow mounds). 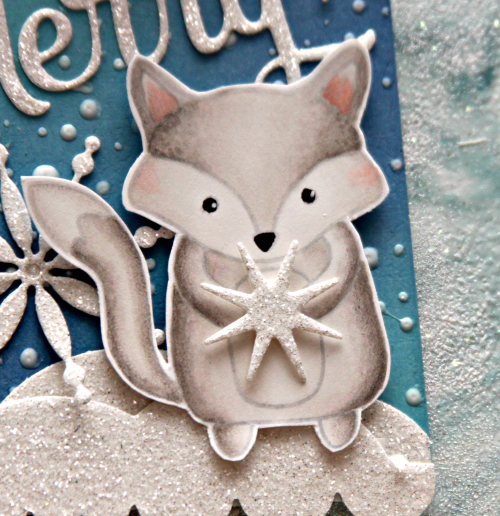 I colored up these sweet fox from the Bushy Tail stamp set and did some no line coloring... but decided to make him a gray fox this time... such a cutie! And this time he's holding a snowflake. And left my sentiment short and sweet. I used the Merry word from the Merry Christmas Fri-Dies and decorated with a few snowflakes from the Funky Flakes Fri-Dies! 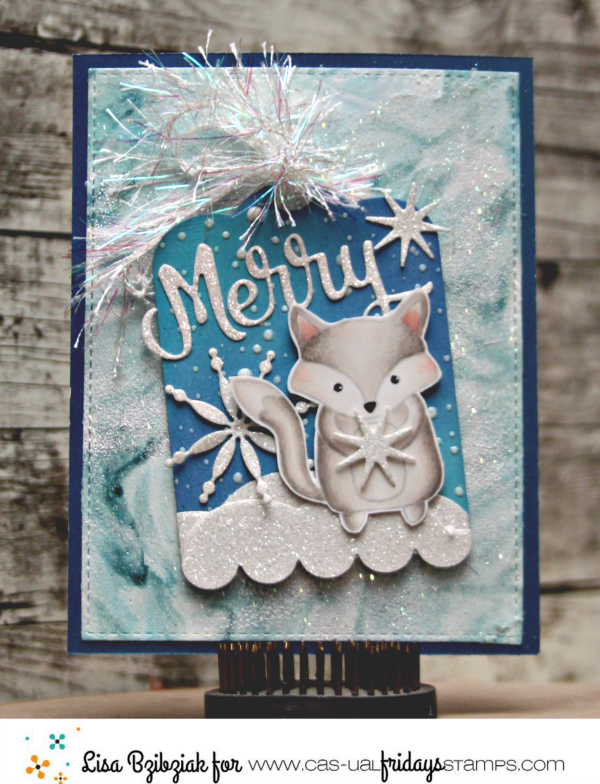 Originally I was going to keep this just as a tag... but I loved it so much I decided to make a card out of it and it was a great way to use that shaving cream background! And I'm playing along with the Sparkles/Christmas challenge over at the Wow Embossing Powder Fans Group. 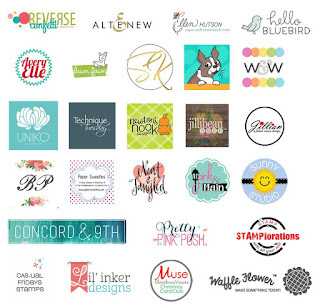 You must join the group to play along but you'll love it... there is lots of inspiration over there! 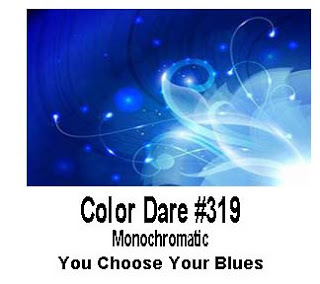 I'm also playing along over at Color My Heart Color Dare where they have a Monochromatic Blue challenge going on and you should check that out too! 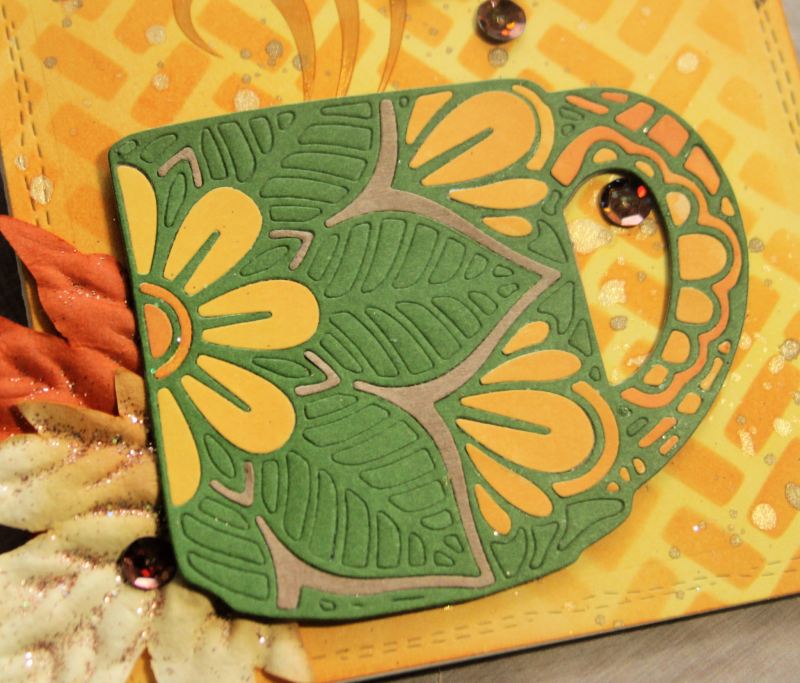 Hope you enjoyed your visit and thanks for sticking around until the end! See you again soon! 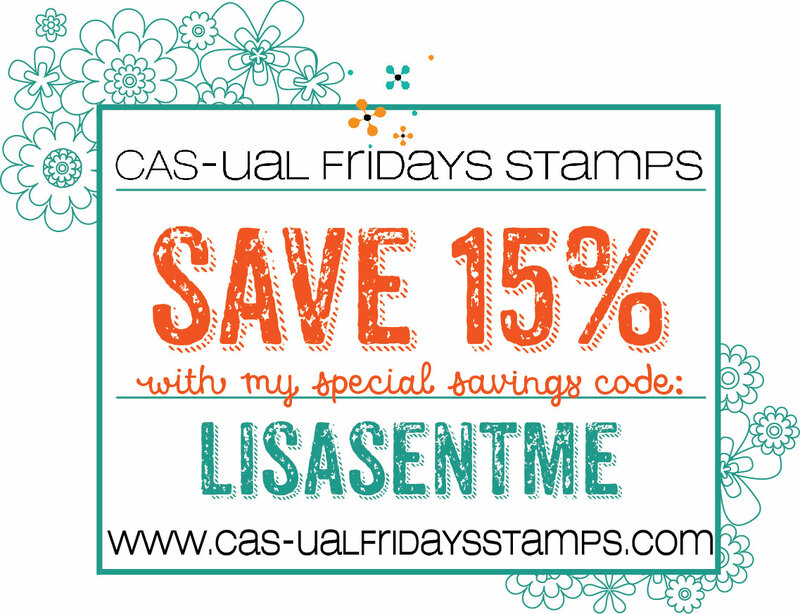 Don't forget about the special that is going on right now too! 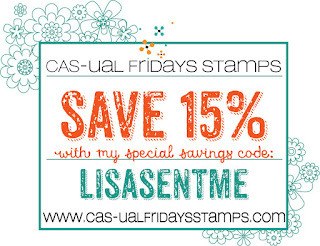 So here are the details regarding this stamp set! 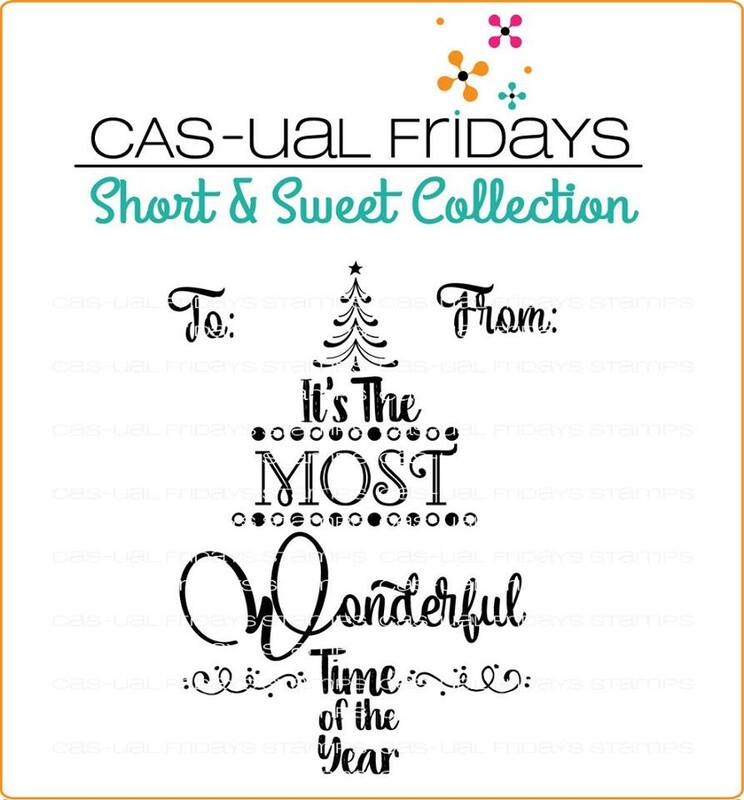 It will be available for purchase for $6.50 or you can get it free with a qualifying order of $50 placed November 20-26th! 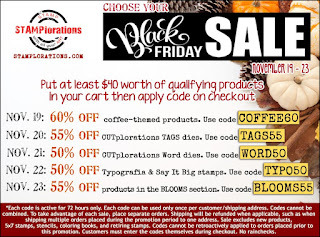 Your order must total at least $50 after discounts and shipping. 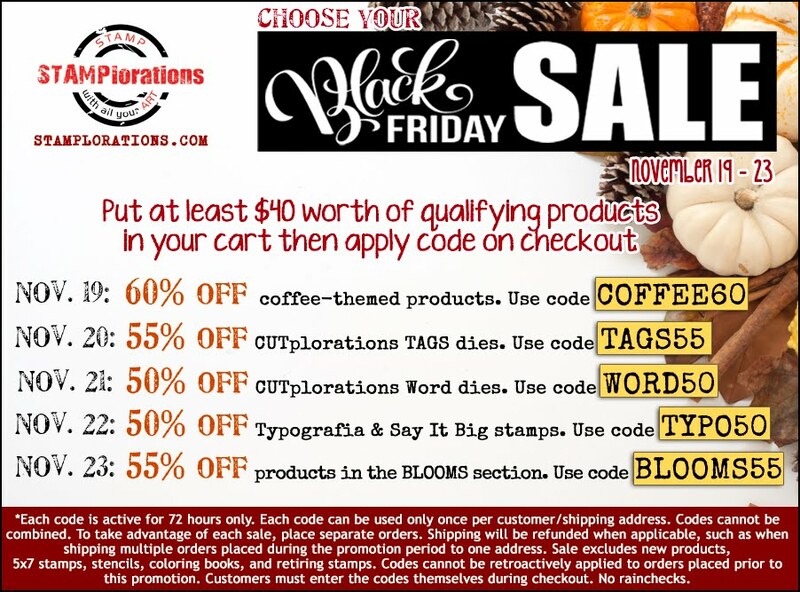 No code is needed-it will automatically be added to your order when it ships! On the 27th, the set will be offered in the shop for $7.99! You can find this set here! And you can check out the tag I made using this set here if you'd like! 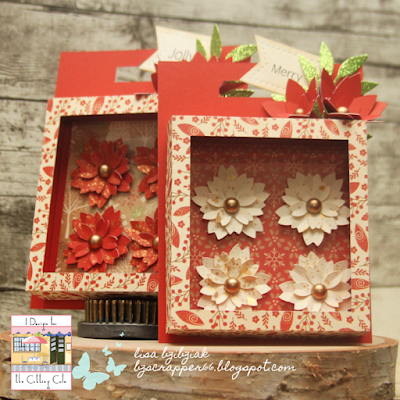 I have a giveaway for this stamp set going on at my blog here and all of my DT sisters are doing a giveaway too! 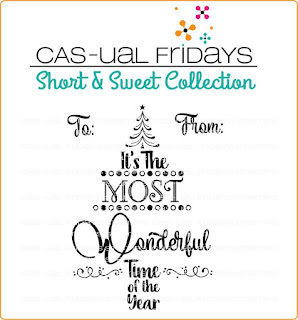 Find links in the main 25 Days of Tags post at CAS-ual Fridays here! 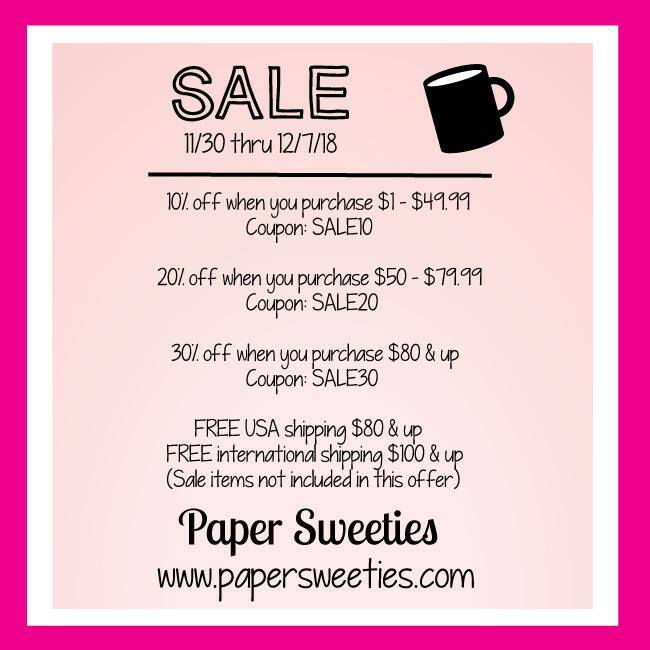 Woo hoo there is a sale going on here too! With deep discounts on retiring items and all items in the Christmas/Hanukkah section are on sale through the 26th!